Hemangioma is a common type of vascular tumour which may occur early in life and resemble a birthmark, also called as strawberry hemangiomas because of their appearance. It appears as a rubbery, bright red nodule of extra blood vessels in the skin. A Hemangioma grows during the first year of life and then recedes over time. This can occur anywhere on the body, commonly appears on the face, scalp, chest or back. 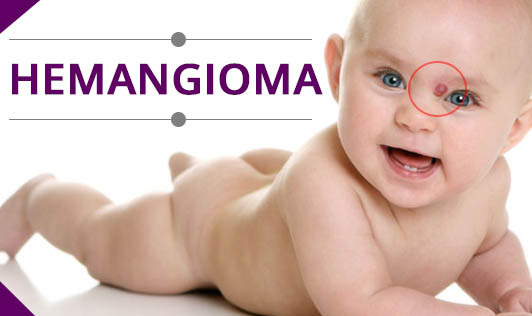 A Hemangioma may be present at birth, but often appears during the first few months of life. It usually starts out as a flat red mark anywhere on the body. The red mark grows rapidly and becomes a spongy mass that protrudes from the skin. It is not quite clear what causes the blood vessels to group together, although there may be a hereditary component involved. In most cases, the hemangiomas resolve by age 5 or 10.The colour of the birthmark fades but permanent discolouration of the skin or residual extra skin may remain. Hemangiomas that develop lesions or sores may require treatment as it may interfere with your child's vision, breathing, hearing or elimination, but this is rare. The treatment options include laser treatment, medicated gel, surgical removal and corticosteroid medication. It's important to monitor your child's Hemangioma. If the Hemangioma bleeds, appears infected or forms a sore, contact your doctor immediately!